This page presents the base API that one needs to implement to add support for new sensors or actuators. This API can only be used to implement drivers for single sensors (this limitation is due to the fact that the base API only allows the driver to define a single Feature of Interest (FOI) and a single sensor description). This means that a driver implementing only the base API would have to be instantiated N times to connect to a network of N sensors. Fortunately, SensorHub also defines an extension to the base sensor API allowing one to write drivers that can wrap sensor networks of any size within a single module. Please see the Sensor Network API page for more details. Details about these different classes are given in the next sections. Note: Several sensor drivers can be packaged in a single Maven module, although we encourage this only if the drivers are very closely related and/or have tight inter-dependencies. Each data interface is an output that gives access to a stream of sensor measurements and is an implementation of ISensorDataInterface. Data interfaces are asynchornous in the sense that each of them can produce data at a different rate. Each control interface is an input that can receive commands and is an implementation of ISensorControlInterface. Each control input can receive different types of command messages. 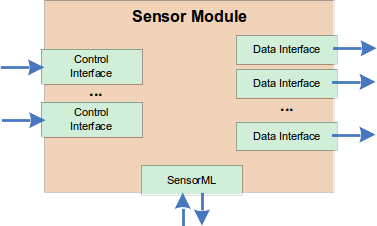 A sensor module implementation must also provide the description of the sensor as a SensorML process (any class derived from AbstractProcess is acceptable). Usually, this sensor description is a mix between information auto-generated by the driver and information provided as a SensorML file by the user. Versioning and updating the sensor description can be optionnally supported by the driver. In order to help you implement the API, we provide the AbstractSensorModule class that is a simple partial implementation of ISensorModule and can be used as the base for most sensor modules. It provides default implementations of most methods in the API. The measurement record description must be provided as a tree of SWE Common data components (DataRecord, DataArray, Quantity, Time, Count, etc.). This structure will automatically be used to populate the output section of the SensorML description. A recommended encoding must also be defined which is usually text for simple measurements and some binary flavor for imagery, video and other multi-dimensionnal datasets. These components and encodings are provided by the lib-swe-common module. All data streamed through the same data interface must be synchronous and time-tagged together. The AbstractSensorOutput class is provided to reduce redundant code and help you get started. It is a basic partial implementation of ISensorDataInterface that can be used as the base for most sensor modules. The AbstractSensorControl class is provided to reduce redundant code and help you get started. It is a basic partial implementation of ISensorControlInterface that can be used as the base for most sensor modules. A configuration class derived from SensorConfig must be provided with the new driver. This class is used as a struct that contain public fields carrying the configuration of the sensor module. All public fields in this class are used to automatically generate the administration user interface of this particular driver. Nesting configuration classes is supported. Maintaining a history of sensor descriptions (this is because, by default, this feature is better handled by the persistence layer in SensorHub). Consequently, the AbstractSensorModule class returns false in the two methods reporting support of these functionalities. Like any SensorHub module, a sensor driver must implement a class derived from this interface to become discoverable.